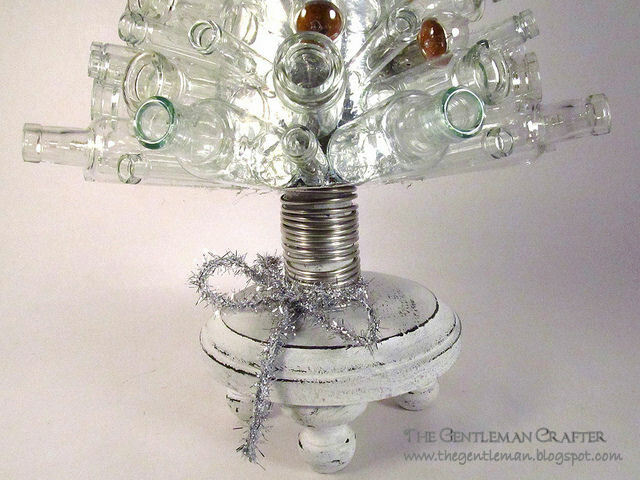 The Gentleman Crafter: Uncorked Christmas Tree- and A Wonderful Video! Hope your day went well and that you are crossing things off your Christmas list. Me....Well, Kinda! I wanted to share a couple of things with you tonight. First off, I received an email from Lollydollycrafts and Toby tonight. They wanted to share their incredible YouTube video of making the snowflake with me. I cannot even begin to tell you how I had the biggest smile on my face watching this. So much so, I wanted to share the video with you and hope that LollyDolly doesn't mind. Toby and LollyDolly, you all did an amazing job! I am so impressed! Toby, you can fold paper man! Great Job! Next, tonight I wanted to share a project that I just completed. I needed something for a gift for a party I'm going to and this was just the thing. Now, being totally honest here, this was a fairly expensive project, but it so needed to be done. LOL! Ever since I did the Jacked Up Jack o' lantern for Halloween, I had wanted to do this. 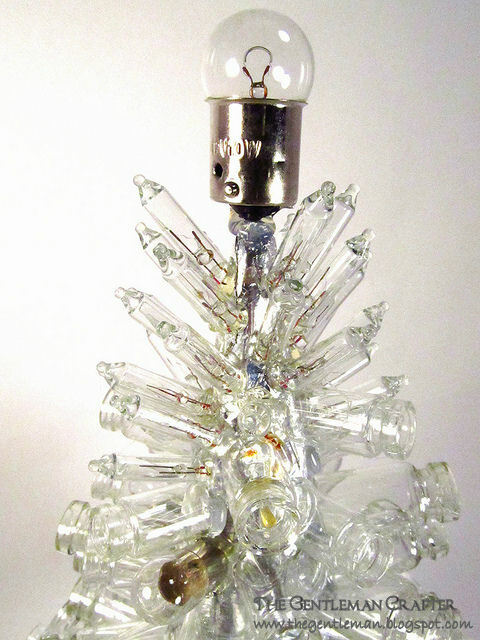 Why and what does the Jacked up Jack have to do with this...The brim of Jack's cone hat had the corked vials on it...which in turn gave me this URGE to make the tree! And YES, If you live in the Austin, Georgetown, or Round Rock area...I was the person nabbing all the Tim Holtz Idea-ology corked vials from each and every craft store for a month! Sorry! They are now available....Hehehehe! 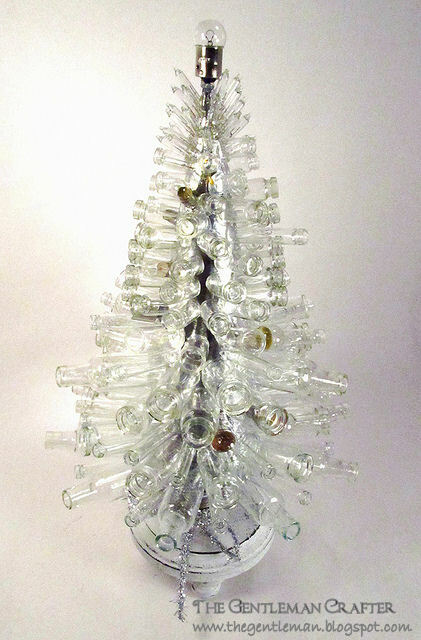 So here is the Uncorked Christmas Tree...Hope you like it and I really hope my friend likes it! Keep your fingers crossed! This is so amazing! What an awesome gift and a creative idea.. Jim where do you get all these amazing ideas... You are one clever cookie! Thank you so much MidnightScrapper! I appreciate it! and Toby did a great job! So amazing! Wowie!!! This is crazy good. As always, Thank you Sharon! You rock! very creative tree thank you for sharing. Thank you sharing the video I loved it and am going to give it a try with my grand daughters. Toby is a delight. Isn't Toby awesome! He's going to be an excellent crafter! Wendy did an excellent job of showing him! What a wonderful team! Does that tree light up? It is awesome. yet one more thing I don't have time to do! Don't burn yourself out Mr. Jim. Be sure to save some energy for later. (No digging in the drawers for Lindts). Hope you are keeping up with your calendar. I cannot tell you how much I have totally enjoyed the advent calendar you sent me! I have had so much fun going and checking each day. I mean really looking forward to whats in that days drawer! It's been a blast! Thank you so much again Kim! I truly love and appreciate it. So does that mean that I send it back to you after Christmas is over for a refill? LOL! You are on your own for the refills. The challenge is finding small stuff to fit. Thank god you are a crafter. Ma kes it easier. I have already forgotten what was in the calendar. You may have to text each day what you find. You are amazing. Also loved the video, thanks for sharing! Oh Thank Gail! Appreciate you! Dude! Does it light up?! That is amazing!!! Princess LadyBug! That is too funny! My mom asked me the same thing! LOL! I need to redo it now and make it light up! Be back later! LOL! Thanks tons for always coming by Princess! So appreciate ya! And no thanks needed. I love all your videos & blog posts! Awesome idea and you executed it brilliantly! Ps. Luckily I wasn't looking for those vials, but in your travels did you hopped to see any light bulbs covered with that rubberized glaze?? I have a THING for lights and christmas trees...This is fabulous. I will attempt to make one that lights up...it might get a bit hot though all bunched together like that, but I gotta try! Jim, First of all the video is Adorable! I too made some snowflakes tonight. I posted them on my blog http://shariscreationswiththecricut.blogspot.com/ Check them out if you get a chance. Thanks so much for showing us how to make them. Fabulous! What a stunning creation, you are a seriously talanted man Jim. Love it! Jim please pray tell me how you come up with such ideas! I would liek to be inside your head for like 10 minutes. This is just an amazing tree, yep give you expensive one but what a gift to have in your home. Out of the park. Amazing tree!!! Such a wonderful design. WOW..OH...WOW...those were the exact words coming out of my mouth when I saw your amazing tree!!! Yep...not a frugal project but oh so cool!! I asked myself the same questions other asked...does it light up? It would be totally over the top if it does. Loved the Toby video...patient mum and sweet lad! Thanks for sharing. This is spectacular!! How could anyone NOT like it? What a wonderful gift! What a cool idea Jim! It made me want to sprinkle a little glitter into each one of those cute bottles. Wouldn't it be fab to graduate the colours from light to dark - gotta love where inspiration leads. Thanks for the inspiration. That glass tree is awesome, unique - can you grab more bottles and make me one please?!?!? I've been a sorta good girl this year! OMG Mr. Clever this is just toooooo cute!!! Where to you get all the "bright ideas". I won't be tackling this one but so glad you did....love it!!!!!!! Holy cow!! Too fabulous for words! Love the snowflake and Wendy & Toby video. I think we make have an English Gentleman Crafter in the works, Jim. It is wonderful to see families sharing in crafting. These tiny bottles are so wonderful on their own, but when you take them and make a Christmas tree they're suddenly truly fantasic. I think you were well within your rights to nab all the bottles within your reach to create this idea.I'm warning you - when you show up at the party, everyone is going to want one. This tree is a treasure that can be put out year after year. Bottled Christms spirit! Dude...Where's My Lightbulb!?! I mean of course this is truly a 'Lightbulb' moment. I'm in LOVE & I sooo believe this heARTistry, your Friend is going to LOVE to! I am smitten over LollyDolly & Lil' Toby. I'm so going to have to delve into it. Thank you so much for sharing their video & putting a smile on my face on this lovely day. So much Holiday inspiration that your spreading cheer to last way into next year! Crazy cool tree, Jim!! You are da bomb! Love the tree. Are you going to do a tutorial on it? I want one. Holy Christmas tree, Batman! This is fabulous! I bet it just catches the light like anything. You never cease to amaze me! Hey Jim. This is magnificent! I would love to go for a ride in your head....imagine all the amazing crafty ideas I would see. Crafters Heaven. This is incredible and THE most creative thing I've seen in a while!!! Awesomely Gorgeous!!! WOW...another craftgasmic make Jim!!! You are the BEST!!! You ROCKED that tree Jim !! Cute video worthy of a Jim smile !! WOW!! Your brain is on "superior artistry steroids" and I want you to share with me, please! Fabulous job as always!